Cylinder head temperatures are one of the easiest and most cost effective ways to measure the health of your engine on-the-go. When you're racing, you want maximum power at all times. The downside is that it's easy to push the engine a little past the optimal point, sending cylinder temperatures through the roof and in-turn causing seizure and other nasty damage to your engine. There's really nothing more scary than locking an engine up at full speed down a straight. If you've ever experienced this, you'll know what we mean! This happens when the piston seizes or 'melts' into the bore, stoping the engine from rotating which in turn locks your wheels - it's like hitting the brakes with maximum force and them sticking on full. Most engines perform best when the air fuel ratio is at a specific amount. We won't go into detail in regards to the ratio, but the important part is that a mixture with more air and less fuel burns hotter (a lean mixture) and a mixture with less air and more fuel burns cooler (a richer mixture). So why not just make it rich, you say? Thereby solving the issue all together? Well that's a great idea in theory, the problem is that engines don't perform well when they are runnig a richer mixture. Again we won't go into the detail - you can find that information by googling - but the important part is that your engine will respond better and better the leaner the mixture at higher RPM. When running an engine on the lean side of the fuel mixture, engines can get to a point where they perform phenominally but they become too hot, causing detonation which increases the heat even more - so hot that it literally melts the piston. Clearly this is bad, and needs to be avoided. The best way to avoid engine failure is to keep an eye on your cylinder head temperature. In the past, the cost of equipment to do this has been very high - requiring a laptimer style unit in the region of $500 plus the sensor lead. 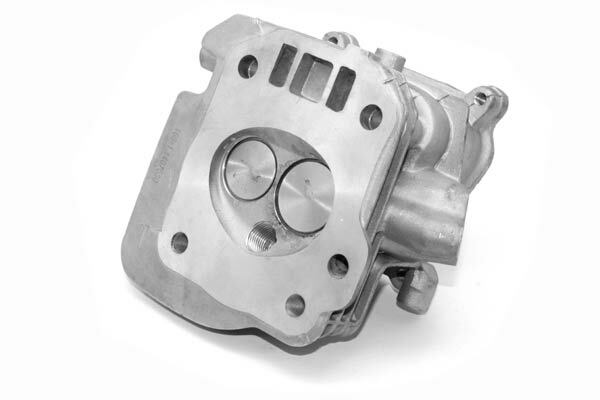 CPR Kart Parts has developed a new low-cost unit which offers the ability to view the cylinder head temperature on the fly, check the maximum heat reached at the cylinder head during the race when you get back to the pits, and the abillity to set an alert to notify you of over-temp so you can back off or richen the mixture.